As the mystery surrounding the Shroud of Turin, believed by some to be the burial cloth of Jesus Christ, continues, one filmmaker said he will be making a new film about it. The Shroud, which has been subject to decades of scientific tests and analysis, is a 14.3 x 3.7 foot linen cloth with the front and back imprint of a man with his hands folded. Some believers contest that the cloth was used to wrap Jesus' body after He was crucified. As Rolfe pointed out, the face on the shroud has appeared in Christian imagery at least since the sixth century. “The clear inference was that this face that we now all recognize as Jesus was taken from the image on a well-known cloth of that time,” the filmmaker argued, according to the Express. “This obviously placed the shroud much earlier than the middle ages, which was what had been assumed. “The establishment, instead of saying let’s investigate it, rubbished it. Three decades passed before it was photographed again in 1938. That prompted medical men to get interested. There were amazing details on the body that looked like wounds of a crucifixion — but not as depicted in paintings, with nails going through the palm,” Rolfe continued. In 1988, radiocarbon testing suggested that the shroud was a forgery made sometime between 1260–1390 AD, but follow-up testing revealed that the fibers tested at the time were from a patch added later on the shroud and not part of the original cloth. In 2017, Institute of Crystallography researchers found traces of blood on the relic, but a study published by the Journal of Forensic Sciences in July suggested that the bloodstains matched that from a standing model, rather than from a crucified man or a facedown corpse. The scientists were looking to determine whether the blood patterns match the crucifixion of a person in a T-shaped or Y-shaped manner, but an experiment on a model found that the boodstains did not match with any pose. 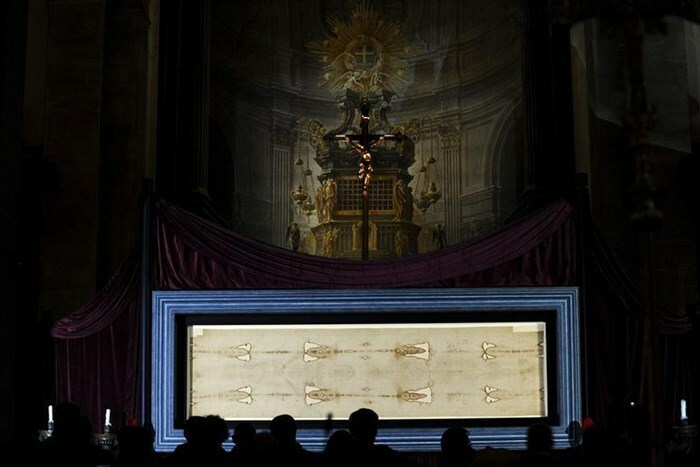 Interest in the shroud continues, however, and in March an Italian professor created and unveiled a 3D image of a person based on the imprints in the Shroud, giving insight into what Jesus might have looked like, if the shroud's authenticity is to be believed. "According to our studies, Jesus was a man of extraordinary beauty. Long-limbed, but very robust, he was nearly 5 ft. 11 in. tall, whereas the average height at the time was around 5 ft. 5 in. And he had a regal and majestic expression," said Giulio Fanti, teacher of mechanical and thermal measurements at the University of Padua. "I counted 370 wounds from the flagellation, without taking into account the wounds on his sides, which the Shroud doesn't show because it only enveloped the back and front of the body," Fanti added. "In addition, the three-dimensional reconstruction has made it possible to discover that at the moment of his death, the man of the Shroud sagged down towards the right, because his right shoulder was dislocated so seriously as to injure the nerves."